If you love to garden but hate to weed then you might want to learn the benefits of mulching your garden. A step that most gardeners skip over but so incredibly beneficial to your plants. Then in March, I start all my peppers and tomatoes indoors, which is easy by the way. If you have never done it you can read How to Grow Your Own Tomato Plants From Seed to learn how. I tend to them daily, watering and adjusting their lighting. I just love to watch them sprout and grow. It really is amazing what happens all because we put a seed into a pot of dirt. Next, in April I begin to prep the soil. Getting everything ready for my young and fragile plants. May is when it all gets planted. From the new seedlings to the packets of seeds. All in neat little rows. June I water and water and maybe water some more as everything begins to grow and the garden gets greener and greener. July is when it hits. Thousands and thousands of weeds. A few years ago I began mulching my garden…HEAVILY. Since I have been mulching my garden, weeding is pretty much a thing of the past. 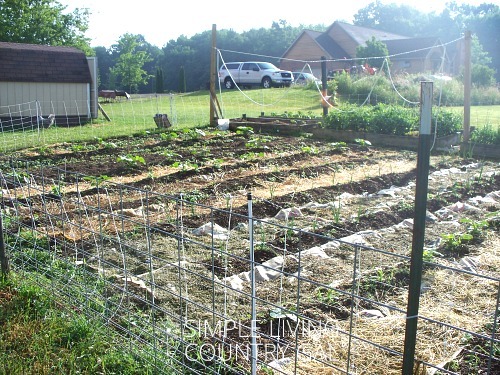 No, it isn’t pretty in the beginning, but as your plants grow and thrive the mulched rows will disappear. Plants will produce more without a cluster of weeds hogging all the nutrients in the soil. And diseases will be a thing of the past because now you will have more time to really look at your plants and catch things early. Why should you mulch your garden? Well first of all, as I mentioned above, to keep the weeds away. Listen, homesteading is a lot of work and there seem to be so many chores that always need to be done. Why not do what you can to limit how often some of those chores need to be done so you can put your attention elsewhere? Next, mulching protects your plants from disease. Most diseases happen during watering. When we water any soil born pest or illnesses can splash up onto the leaves. This is bad and something you need to keep from doing if at all possible. Mulching prevents that by acting as a sort of splash barrier. Mulching also works great at keeping moisture in the soil. This is great if you live in a dry area. Keep that moisture in where the roots are and really help your plants to grow big and strong. 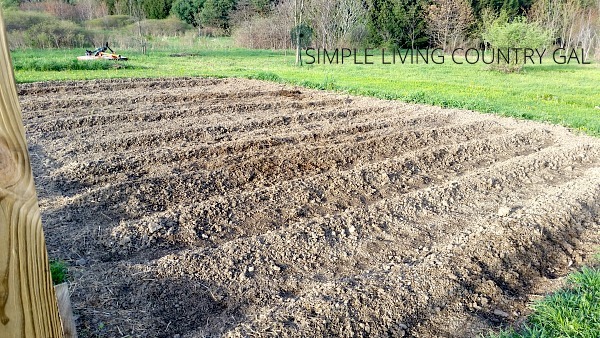 Make sure you mark your rows well so you do not mulch over seeds. I use mounds to plant so my rows are easy to see. Planting in mounds is also helpful if you have a very rainy season. The mounds keep the water from rotting out the roots of the plants allowing them to flourish and grow. This is especially true with onions. They do so much better when planted in mounds, find out how I plant this way HERE. Lay down a layer of newspaper or brown paper feed bags in between the rows. This will act as a barrier for the weeds making it hard for them to get through and grow. The newspaper is perfect to use because it is thin and will compost down fairly quickly. Usually, by the end of the growing season, you will have shreds of paper instead of the whole sheets you put down in the spring. When you are closing up your garden for the fall and see just too much paper you can remove some of the larger pieces. The small ones can just be worked into your soil. If you are concerned about the ink and composting it directly into your garden, you can read more HERE. There is some debate as to whether or not composting newspaper is a bad thing, so do your research and make the choice that is best for you and your garden. Rake – A must have for any gardener. Pitchfork – This is great for working in compost and spreading mulch. Wheelbarrow – The older I get the more important this tool is! 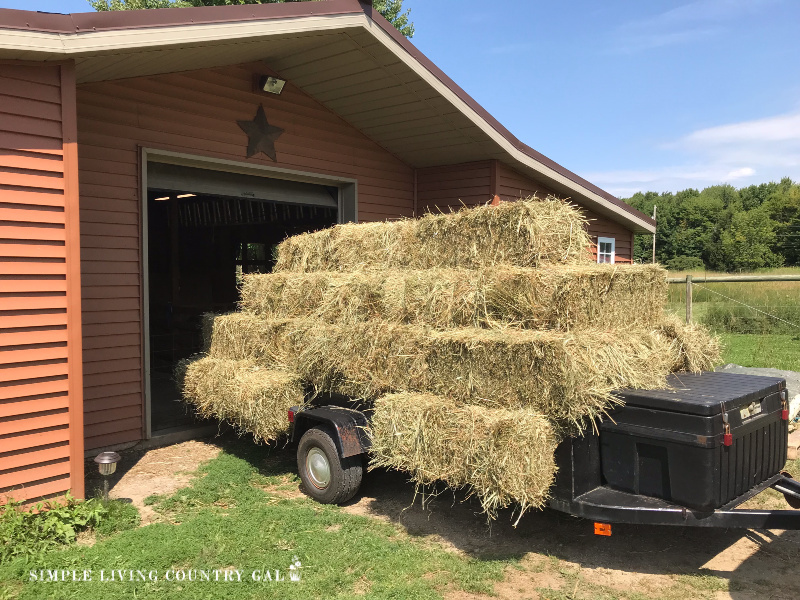 Wagon – A great way to move plants and other objects around the homestead. Hand tools – Don’t buy cheap here or they simply will not last. Kneel pad – I used to laugh at these, but now I LOVE them! They really save my knees. Be sure to place your paper as close to your plants as possible without hindering your watering. You want to keep the weeds away yet not strangle your plant. A few inches of space will be just about perfect. Grass clippings are a great option for this step if you have them. You can also use leaves or straw. 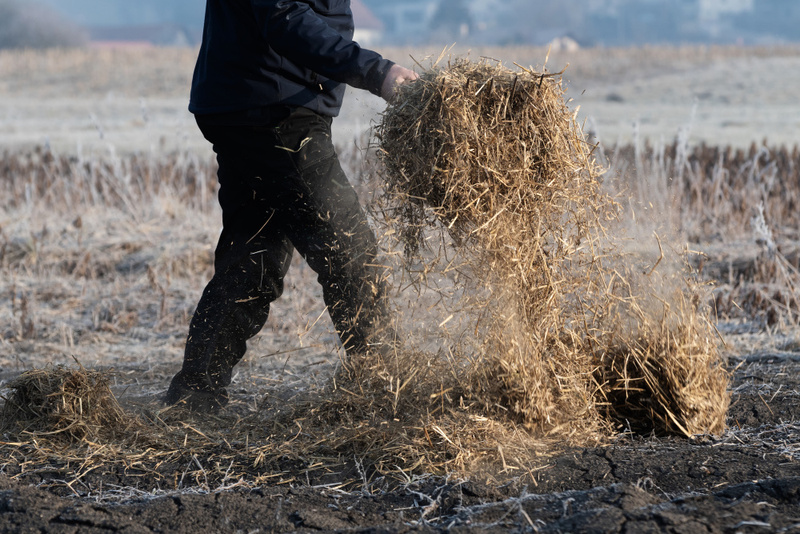 Do not use hay when mulching between your rows since hay contains seeds. Not sure what the difference is between straw and hay? The purpose of the mulch is two-fold. First, you need to hold that paper down so it doesn’t blow away. Remember, the paper is the weed barrier so holding it securely in place is key. Second, and the green matter (nitrogen-rich) and brown matter (carbon-rich) will benefit your soil. This is the mulch you are using to hold the paper down. If you are not sure what your soil needs, you can purchase an inexpensive soil test kit. These kits are great to have on hand. They are super easy to use and work remarkably well. You can purchase one HERE. This step just ensures that all your hard work doesn’t blow away. The goal here is to give a good water but not heavily soak things. Like I said you are just anchoring down the mulch and the paper so it doesn’t blow away in the wind. Mulching for me takes at least a week or two. I prefer grass clippings but in spring those are hard to come by. Hubs has learned to dump all grass clippings next to my garden. This way I can mulch as I go and everything I need to do the job is close by. If you have a big garden the tip here is to do a little every day until it’s done. Small steps help to make a large job less overwhelming. Weeding can be very time-consuming and sometimes a shock to a new gardener. Although mulching is quite a bit of work, in the beginning, it is an investment that will save you a whole lot of time later on in the season. And don’t forget the added benefits of giving your plants room to flourish and grow. 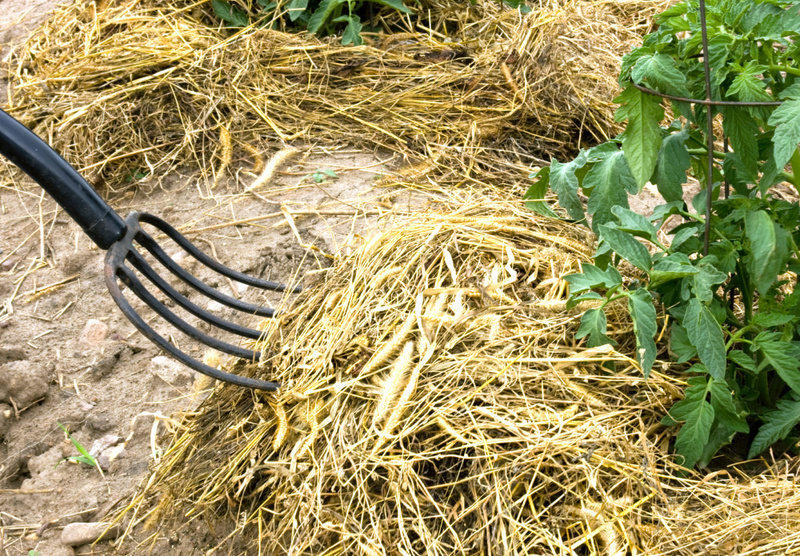 Have you tried your hand at mulching your garden? If so, how did it work for you? With my raised beds I mulch all around my plants. Especially my tomatoes and pepper plants. The reason is that if our soil splashes up onto our plants when I water I tend to get diseases rather quickly. Once I began mulching all the way around the base of the plant as well, no more diseases! 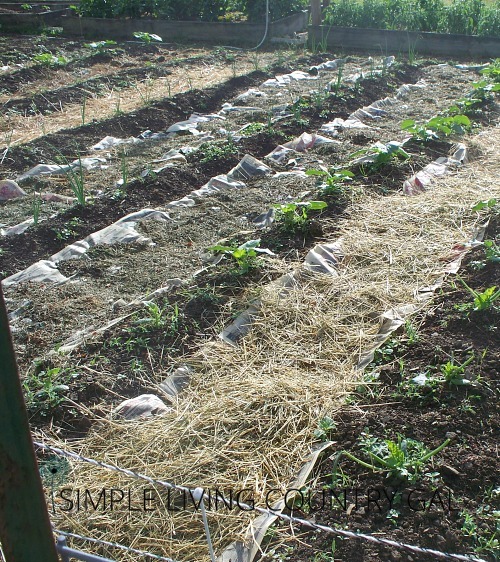 Now, in my other part of my garden (the big lower part) I just simply mulch the rows. However, it was so incredibly weedy this year from all the rain/sun that I couldn’t keep up. I am rethinking and may mulch in-between the plants on the lower garden as well. Sorry, not much help I know!